Would you like to try something new, fun and exciting? Does your dog like to use their nose and be mentally challenged and stimulated? Check out Sporting Scent Detection, the newest sport where all dogs are welcome!! 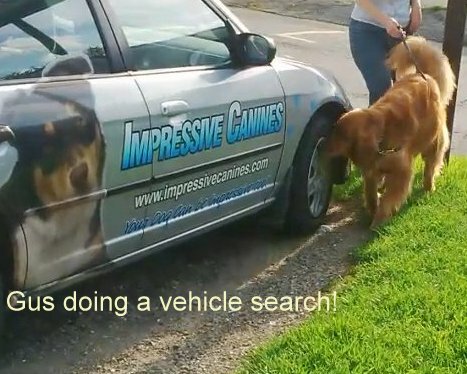 Click below to watch some of Impressive Canines clients find scents hidden in an off site building. The owners did not know where it was and had to trust their dogs instincts and alert cues. We are excited to offer this program at our school and have worked hard to prepare and offer this to our clients! Nothing beats watching your dog use their own senses to find a specific scent hidden in a container, or a box, or under furniture, in a bush or hidden somewhere on a vehicle! You have to try this sport to truly appreciate how spectacular it is!!! Sadly, due to developing a severe allergic reaction to the essential oils used in the Sport of Scent Detection, I can only teach this class in a for fun style. We will use treats scents, human scents, and a few other scents not used in competitive setups. If you, would like to compete in scent detection, I can refer you to another trainer that can prepare you for that. If you want to attend just for fun and to find another fun way to work with your dog and offer mental stimulation, we would love to have you join us! Intro Scent Detection – 4 one hour classes with max 5 dogs for $180 plus hst = $203.40 total. Beginner Scent Detection – 4 one hour classes with max 4 dogs for $200 plus hst = $226. The Sky is the limit, and all dogs are welcome to join in the fun!!! I love watching the dogs work and have a blast finding the scent! Would you like to continue your training in a new game like style? Have you ever thought, it would be nice if my canine put their own toys back in the toy box at the end of the night? Then this is the class for you! 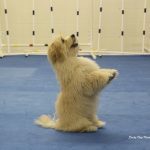 In this session, we will teach you some simple tricks such as shake a paw, wave, rollover, sit pretty, stick em up, pray, be shy, bow, peekaboo and more! 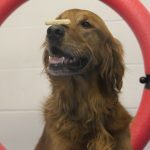 We will also teach you how you can target train, as well as label toys with a name, to assist you with getting your dog to pick up a certain toy and place it in the toy box, or you can simply teach a clean up cue and they put all their toys away. Some useful tasks we may also teach are things like turning on and off lights, picking up your keys, pulling your socks off or bring you your slippers. 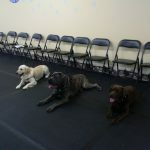 Come join the fun, where your canine will love coming to class and not want to leave! 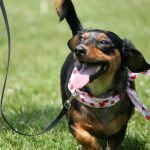 Musical Tails is a fun style class to advance your leash skills, and incorporate some tricks. It will be similar to Canine Freestyle but very inviting for anyone not comfortable with dancing. It is like combining Canine Freestyle and a musical ride 🙂 The benefits to this class, other than having a blast with your dog is that we can strengthen your connection and leash skills around other people and dogs, as well as in a high energy exciting environment where we do speed changes and create shapes weaving in and out and around each other.